The Big Daddy Hydrangea, hydrangea macrophylla ‘Big Daddy’, makes a grand statement in any landscape with its 12” to 14” pink or blue blooms. Color of blooms dependent on soil pH, which can be modified with soil amendments or fertilizer for acid loving plants. Plant as a showy accent, informal hedge or as a mass planting. Impressive in cut flower arrangements. Plant in well-drained soil enriched with organic matter. Water regularly, especially during periods of drought or periods of hot weather. 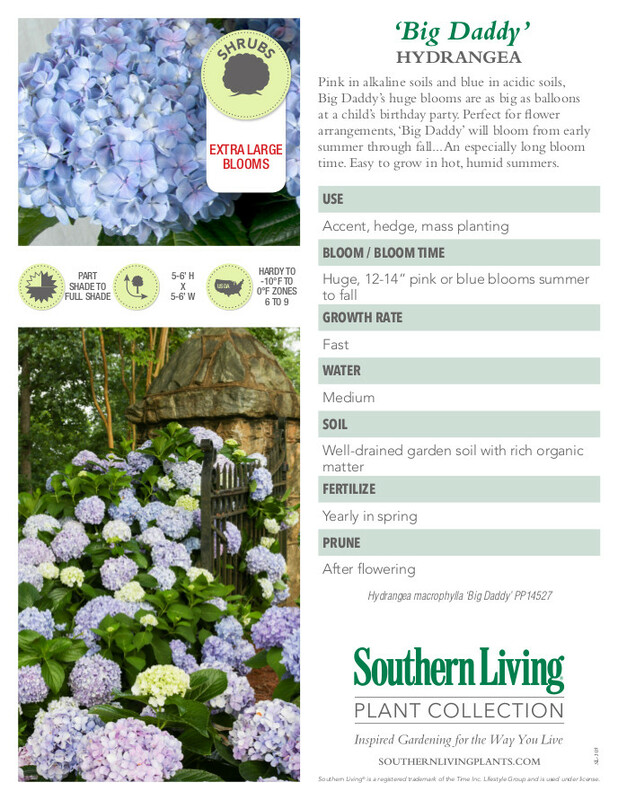 Fertilize in early spring with an acid fertilizer if blue blooms are desired. Prune out any winter-damaged stems in early spring. Pruning, though not generally necessary, should be completed after the first flush of blooms in the spring. For a showy informal hedge or mass planting, plant 5 to 6 feet apart, as measured from the center of each plant.